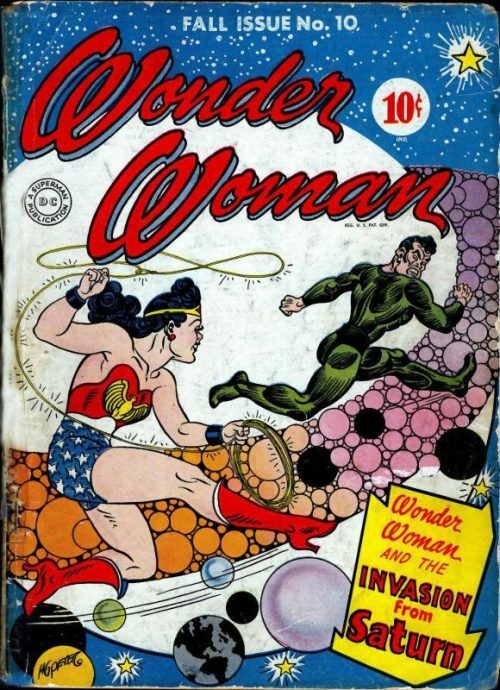 With this issue, Robert Kanigher launched a Silver Age revamping of the book, starting from scratch with a retelling of Wonder Woman’s origin. In this version of events a blonde Queen Hippolyta holds a contest, sponsored by the Goddess Athena, that sends her daughter, Princess Diana to Man’s World. Over the next few issues, Diana assumed a secret identity as a secretary to Colonel Steve Trevor in Military Intelligence. Kanigher also takes the opportunity to revamp many of the original Golden Age villains too. An Amazon named Orana challenges Diana during the contest and a version of this character would make another appearance several years later, challenging Diana once again for the title of Wonder Woman, in issue 250. Also of note is the fact that Wonder Woman’s ability to glide on air currents is revealed for the first time in this issue. The Amazons were a fierce band of warrior women who centuries ago battled the forces of evil. In modern times things became more peaceful and the Amazons retreated to Paradise Island where they lived in peace under the rule of their leader Queen Hippolyta. 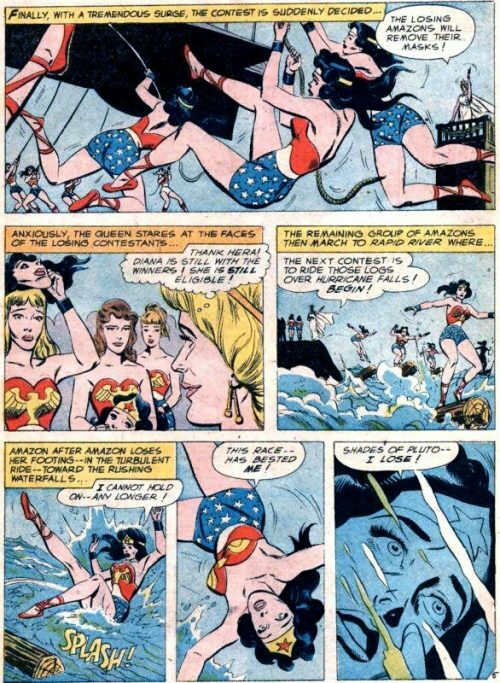 The Amazons would spend their days working on keeping in peak form and shape, among the Amazons would be Princess Diana, the queens daughter whom Hippolyta spent the most time working on. One day the goddess Pallias-Athena would come to Hippolyta in a dream and announce that it was now time for one of their number to have her loyal worshippers determine whom their greatest champion is so that they could travel out into the man’s world and fight evil. Fearing that she might be impartial selecting the chosen Amazon because of her daughter Diana, Queen Hippolyta would be stuck with how to deal with it. 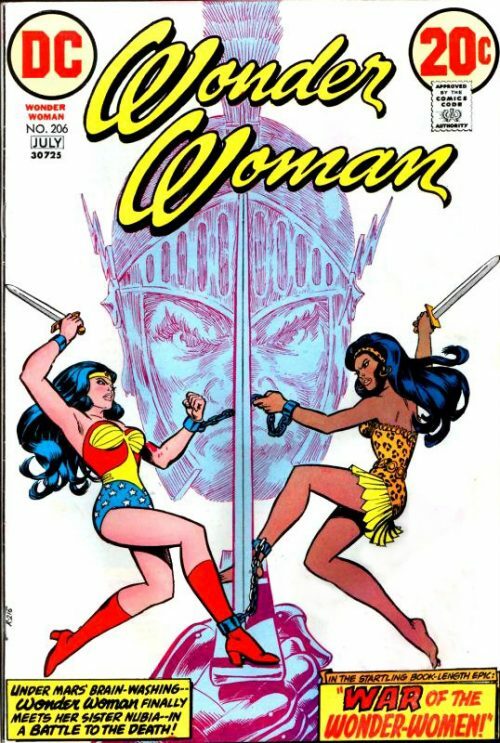 Diana however, would have a solution to the problem and have all her fellow Amazons dress up exactly like her and wear masks so that the queen could not tell the difference between her own daughter and the other Amazons she was testing. As the competitions would go on, Amazons would be rooted out of the competition and the queen would be relieved to find that each person who is disqualified, none of them are her daughter Diana. When there are two contestants left, they have a one-on-one battle against each other along a long tight rope. 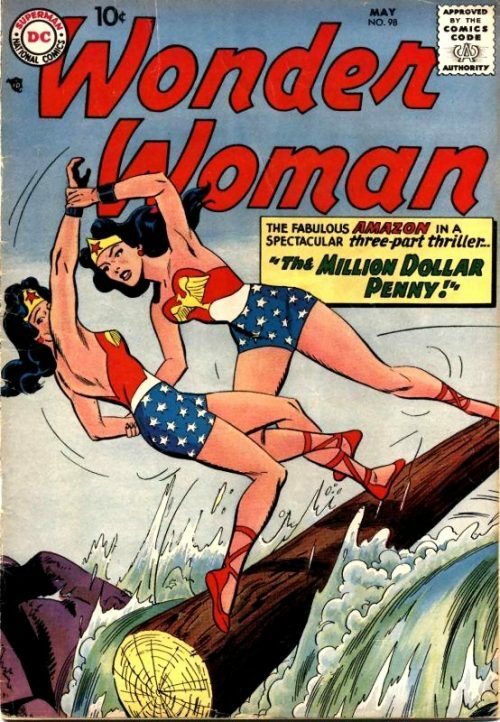 In the end it is Diana’s who is the winner and is crowned Wonder Woman.With her title won, the Queen offers her the first challenge to see if she is truly worthy of the title: Giving her a single penny, the queen tells Wonder Woman that she needs to turn it into a million dollars within twenty four hours so that it can be donated to a children’s charity to build a playground for underprivileged kids. Just then a plane flying over Paradise Island explodes and it’s pilot ejects. When they all see that it is a man, and fear that if he steps food on Paradise Island, then they will lose their powers. Wonder Woman sweeps into action and rides the air currants to save the man and prevent him from setting foot on the island. The man considers her an angel, and when she tries to put him in the ocean, they notice sharks. 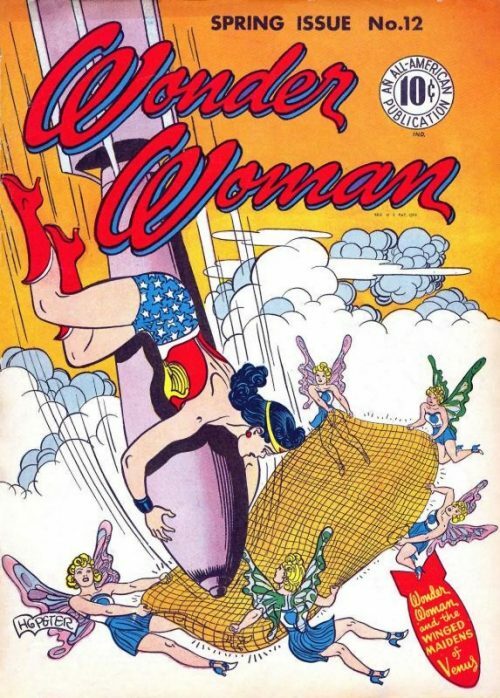 Knowing that they wouldn’t stand a chance against them, Wonder Woman would use her breath to blow air into his parachute and float them to safety on the mainland. On the mainland, the pilot introduces himself as Colonel Steve Trevor part of military intelligence. Wonder Woman explains to her his task, and he finds such a feat impossible. 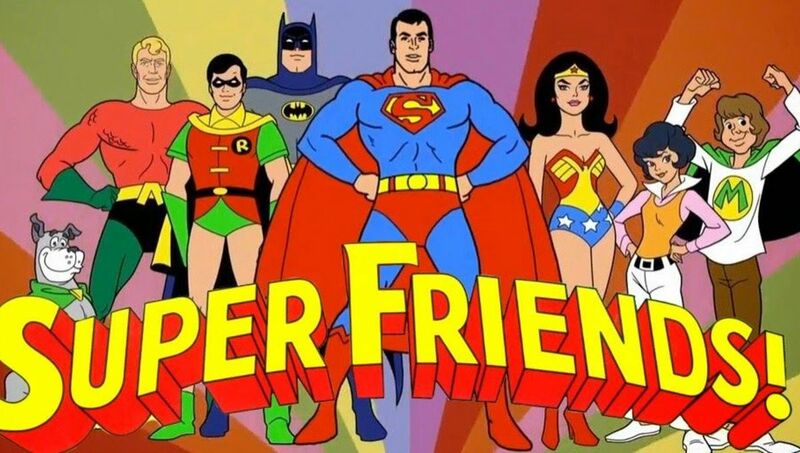 Spying an advertisement for the Twin Cities golden jubilee, Wonder Woman sees that they are having a penny tossing contest, and that the person who can toss a penny across the Twin Cities river would win $1000.00. 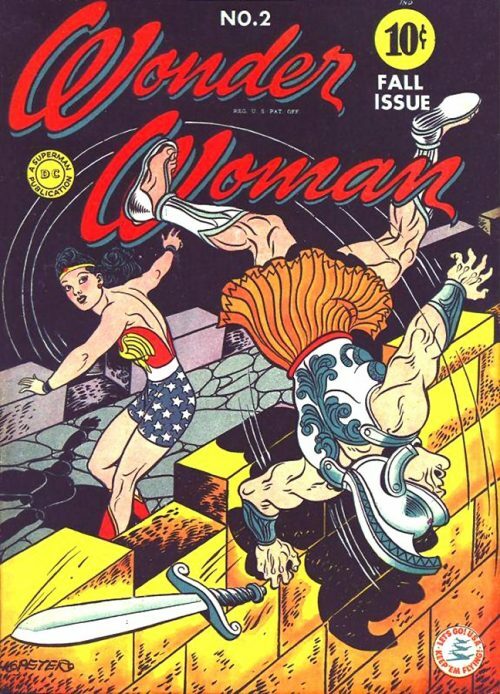 Seeing this as a good start, Wonder Woman rushes off to compete in the contest, however as she goes she drops her penny. It is recovered by a young boy who is jumping rope and he attempts to use it on a nearby slot machine. When the boy wins nothing but the penny back, Wonder Woman asks for it back. 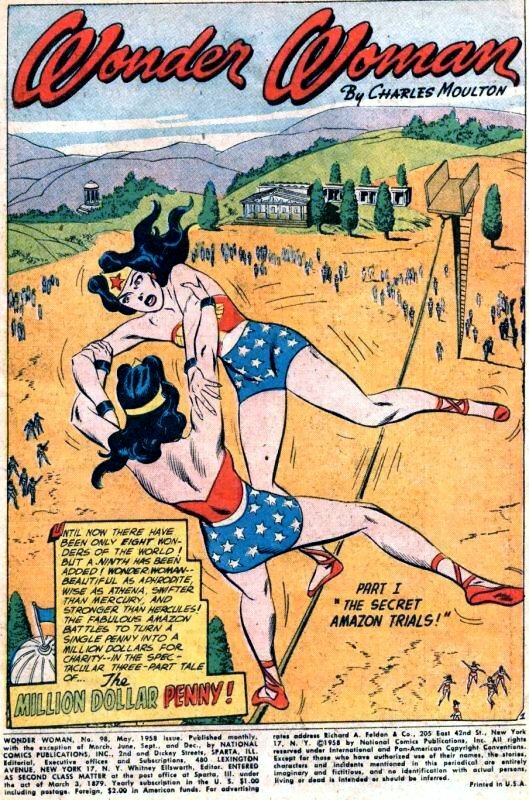 Not willing to do so until she can prove that she is an Amazon, he challenges Wonder Woman to jump rope one hundred times before he feet touch the ground. Much to the boys surprise, she pulls off the feat and he gives her back her penny. Going to the Twin Cities penny toss competition, Wonder Woman enters and attempts to toss the penny across the river. 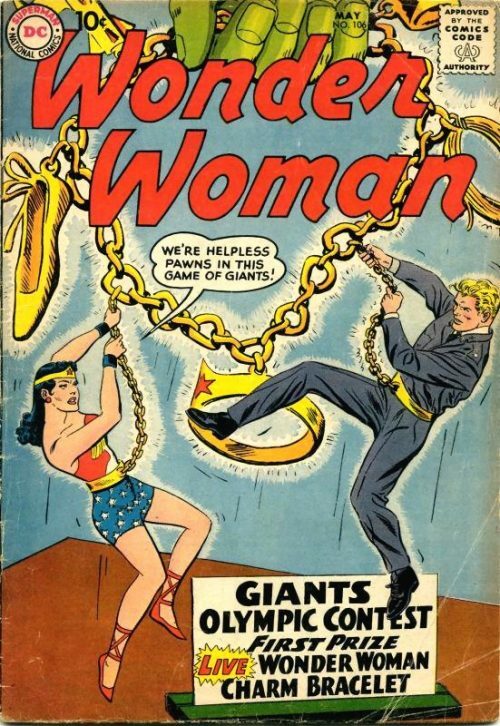 As luck would have it, a passing eagle would pluck the shiny copper out of the air prompting Wonder Woman to chase after it, rounding it up with her golden lasso. She the eagle carries her away, it drops into the river below. 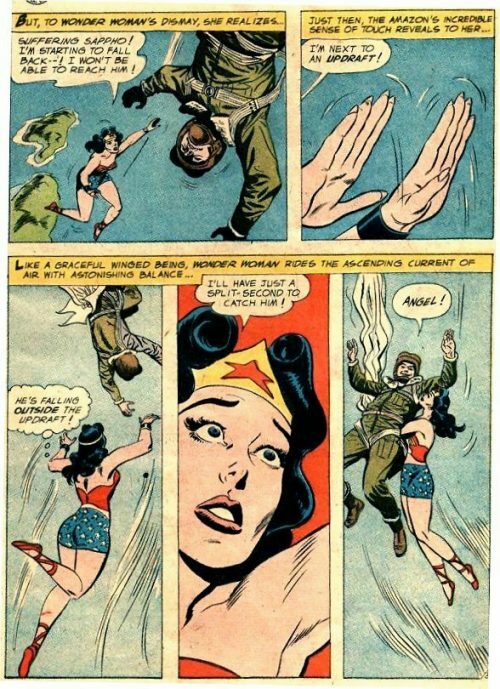 Wonder Woman dives after it and spots it landing on a enemy sub. The sub fires a torpedo at her, and she hops onto it and directs it into the air. High above the sky, she uses her lasso to redirect it to land harmlessly on a beach. She is about to disarm it when suddenly Steve Trevor happens to arrive with some children he takes out for a picnics on the beach. These are the very children who will benefit from the million dollars she is hoping to achieve for charity. 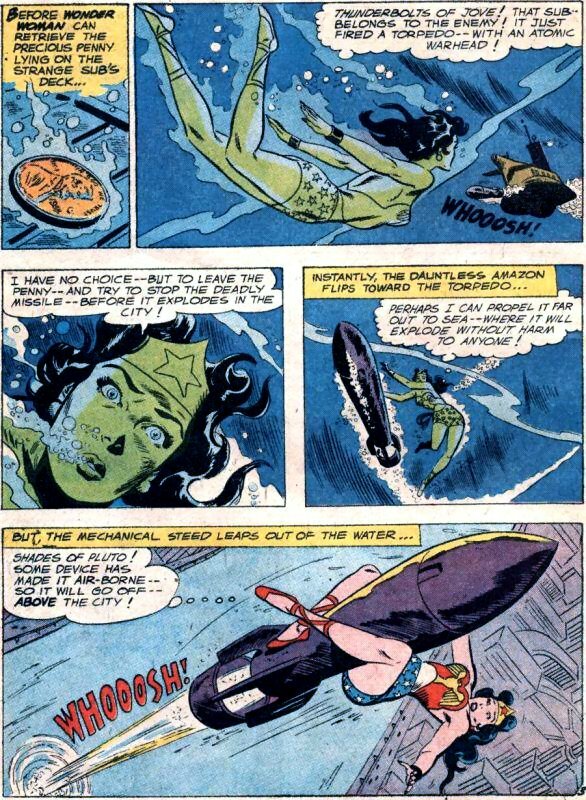 When they fail to hear her warnings, Wonder Woman uses her lasso to spin the torpedo around at super speed causing it to melt into molten slag. Explaining everything to Steve, Wonder Woman goes back after the sub to get her penny back. She finds the sub and it fires another torpedo at her, which she redirects back at her attacker causing the sub to explode. Searching the wreckage, Wonder Woman is out of luck and she returns to the shore without out her penny. She is saddened that she failed at her competition, however one of the children finds the penny had washed to shore and Wonder Woman recovers it. Scouring the city, Wonder Woman finds no means to convert the penny into a million dollars. With time running out, Wonder Woman happens to run across an advertisement asking for bidders to get a contract to build a new bridge for the Twin Cities, the maximum available offer is a million dollars. Wonder Woman convinces city officials to let her build a bridge for the million dollars. Finding her offer seemingly impossible to accomplish in less than a few hours, they take her up on her offer. Wonder Woman then uses her tremendous strength to reshape the penny into a giant bridge for the city, much to everyone is watching surprise. With her mission accomplished, Wonder Woman is given a check for a million dollars by the mayor of the Twin Cities. Relating the story to Steve Trevor, Trevor finds the story amazing, but Wonder Woman shrugs off the incredible tale telling him that any Amazon could have been capable of performing the same feat.